Alan is a painter and printmaker. He currently divides his time between Parry Sound and Old Bonaventure, NL. 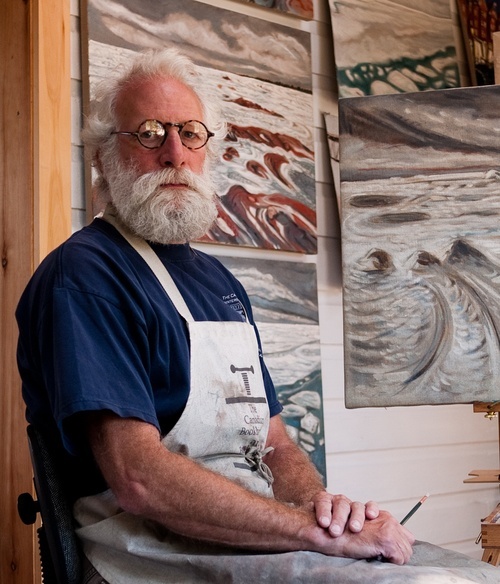 HE is represented by the Roberts Gallery in Toronto, the Masters gallery in St. John’s. After art school in Toronto he studied at Burleighfield School, under Patrick Reyntiens, OBE, head of Central School of Art, London England. He established the Church Street Press in Parry Sound in 1988, where he designs, hand prints and illustrates limited edition books with his own wood engravings. He has had the privilege to work with well-known authors including Al Purdy, Douglas LePan, P.K. Page and Michael Crummey. He is an elected member of several provincial and national arts organizations including the Royal Canadian Academy of Art. A past President of the Festival of the Sound, Alan’s work has been selected for several brochure covers and posters , and live “Painted Sound” performances.